Joe Hart may just have feared the worst as Scotland's Leigh Griffiths lined up a free-kick 25 yards out - three minutes to go at Hampden Park and England protecting a slim lead. Hart's weakness at set-pieces aimed low to his left was exposed at Euro 2016 by Gareth Bale for Wales and Iceland's Kolbeinn Sigthorsson, the 30-year-old getting hands on both but failing to prevent goals, the second of which ended England's interest in the tournament. This time Hart was engulfed by the perfect footballing storm of a brilliant set-piece from Griffiths, a wall that did not jump and poor positioning from the goalkeeper himself, too far over to his right to be able to get near Scotland's equaliser. 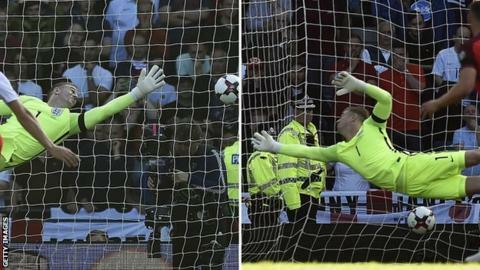 Griffiths repeated the treatment to Hart's right from a free-kick three minutes later and while England snatched a 2-2 draw in this World Cup qualifier, Hart's position as undisputed first-choice goalkeeper has never been under greater threat. Two great free-kicks no doubt - but opponents have sensed the soft underbelly in Hart's game and it will not go away. Is Hart past his best? He was brutally moved on by Pep Guardiola at Manchester City last summer. No-one tempting enough came forward in the Premier League and he ended up at Torino in Serie A, where Italian observers reflected on his performances this season as mixed. It remains to be seen if there are any more Premier League takers this summer than there were last, but this display will have been more of a concern as far as England are concerned. When opposition sense weakness it is probed relentlessly and ruthlessly. Think England cricketer Graeme Hick, a wonderful run-getter, tortured throughout his international career against raw pace. Bale and Sigthorsson were the most high-profile examples of Hart's main vulnerability, when in France he also cut an agitated and over-hyped figure. And Hart simply does not seem to be the goalkeeper he once was. If this is merely some elongated dip away from his highest standards then his timing is also unfortunate. Hart will still be able to operate at a high level but the very reasonable question being posed now is: "Is he still England's best option? Is there anyone else out there?" The fear for Hart is that he is providing the answers to those two key questions with his own indifferent performances. No. Yes. There has never been a more obvious time for change. Hart had a free run at the England goalkeeping position for many years when he enjoyed success at Manchester City - the latest problem he faces is that he is suddenly under pressure from a quartet of contenders. England manager Gareth Southgate will surely take the opportunity to try another option against France in Paris on Tuesday night. It will be a big night for the man who gets the first audition. Southampton's Fraser Forster, who also had his indifferent moments last season, will hope it is him after the 29-year-old giant has waited patiently on the margins while winning his six caps. And, with a touch of irony, Stoke City's 24-year-old Jack Butland must also now be regarded as a live contender to replace Hart. Ironic, because it was on England duty that the excellent Butland sustained the ankle injury, in a friendly against World Cup holders Germany in Berlin in March last year. That injury sidelined him until virtually the end of the recent season. Butland, who has won four caps, was first cab off the rank to replace Hart and this confident, athletic keeper may soon discover that his time has come. Burnley's 31-year-old Tom Heaton had an outstanding season at Turf Moor, although he must be regarded as an outside chance with Sunderland's Jordan Pickford, on England Under-21 duty for the European Championship, another potential long-term successor. Pickford was a shining light in Sunderland's desperate relegation season. He will not be at the Stadium of Light at the start of next term. The 23-year-old has been heavily linked with Everton and he will want a top-flight stage for a season leading into a World Cup. So Hart's problem is not just his own steady decline, it is the fact he has now got the most serious competition he has ever had. If Southgate believes there is a better option than Hart as England goalkeeper he will pick him. The nonsense about "too nice" Southgate has been put to bed forever by his decision to exclude former captain Wayne Rooney from his plans. Southgate is an admirer of Rooney, recognises his enduring qualities, but believes he currently has better to select from - so Manchester United and England's all-time record goalscorer was left out. Hart's big worry will be when Southgate feels the same about him. He will not dodge the call.